In stock 10 pcs. Also available in our walk-in store. 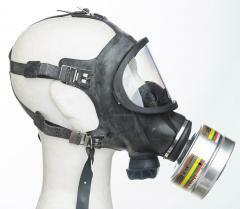 If Soviet rubber socks aren't your thing when it comes to gas masks, check out this modern offering from Germany. First things first: these are officially unsuitable for safety use. 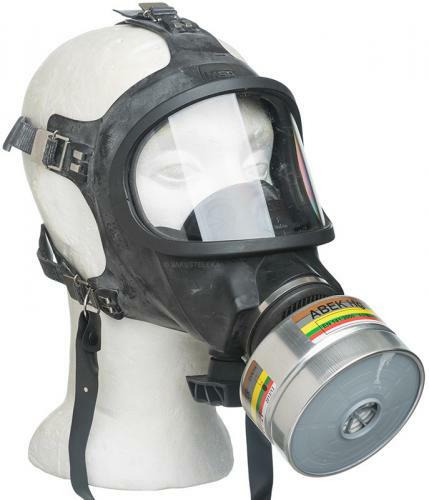 Despite CE markings and meeting all the relevant standards like EN 136, we are not allowed to sell these as protective equipment for hazardous environments. That said, the face pieces are factory new and still have protective talcum powder on them. The condition is NIB. 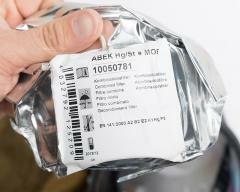 Expiration dates for the filters are long gone (but in the 2000's), but they use the worldwide 40 mm thread standard. Unlike the suspicious Soviet masks we used to sell with filters, these do not contain asbestos or any other nasty stuff. 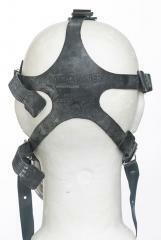 The design is very common: a rubber face piece is tightened against the face with five adjustable rubber straps with metal buckles. A single lens offers an uninterrupted field of vision and the air intake vents blow off any fog as you breathe in, so you actually see things while wearing this. The air outlet can be rotated to different sides and above the filter you'll find a speaker box: while you will sound funny when speaking to others, they are able to understand what you say. 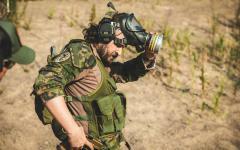 A neck strap can be used to keep the mask in a high ready condition. Top quality stuff, manufactured in Germany. Real deal gas mask, works really good. I bought the mask recently and was overwhelmed. It came *new in box*, probaply only once unpacked and professionaly repacked again in its original MSA Auer package. This mask looks bigger in the web, than it actually is. Mask and filter passed its leak test with the hand on the filter opening. True, ther is some "genk" on and in the mask. It seems to consist of talcum poder or similar stuff. 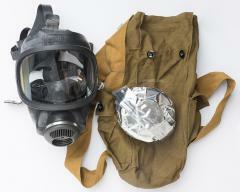 Be advised, the visor scratches easy and there is no key to remove the filtermembrane inside the mask for cleaning. I recomend cleaning the maks with warm, soaped wather. Rubbing of the white stuff with your finger works best. Afterwards, its a good idea to get some rubber/latex care to maintain the mask and make the rubber shine again. The included carienig bag seems to be a bit to small and hard to open for "field usage", however, its a nice addition to having it in the paper box. - you can see really well and in all conditions. There can be some fog forming into the corners but that goes away by exhaling. This issue can be fully dealt with by applying some anti-fogging solution. -once you get it on it stays on. It's a tight fit. - you can't wear much else on your head. A helmet, a headlamp or even a simple baseball cap just doesn't want to work too well with this. - the carry bag is really small. It barely fits the mask and it's difficult to get the mask back in there. - sitting and walking in this mask is okay, but running makes you want to vomit. Be careful, you can suffocate and lose consciousness. - one size fits most-principle doesn't work too well here either. The mask is a tad too small for me who has a slightly larger face than usual. - as I said earlier, it is a tight fit. You can't really put it on quickly or pull it off too fast. You have to re-tighten it to your face every time you put it on. 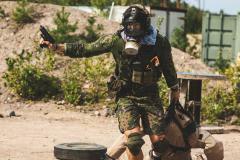 Not worth it overall, you are better off buying a cheaper civilian mask.